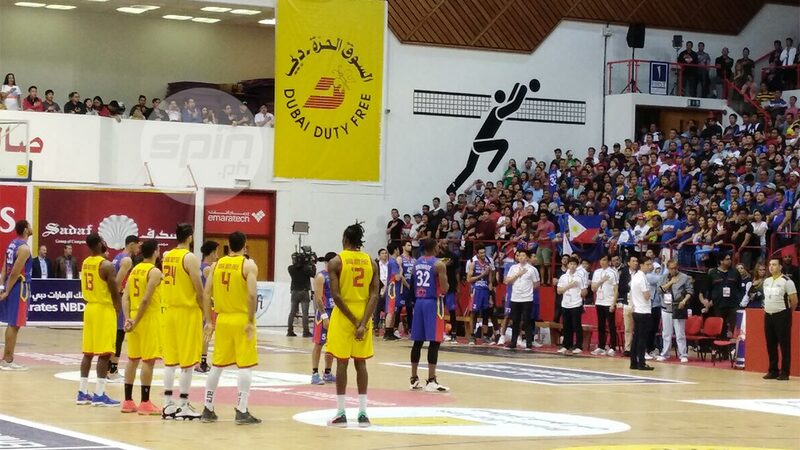 AS the Philippine national anthem started to play at the Shabab Al Ahli Club before Mighty Sports' semifinal game in the Dubai International Basketball Championship, Filipinos naturally put their right hand on their chest in singing the hymn. One man without Filipino blood did the same and showed he's a Pinoy by heart. Justin Brownlee proudly put his arm on his chest while the Lupang Hinirang played as he continued to build his case to be a naturalized citizen. The American cager also let his actions on the court do the talking, proving to be Mighty's go-to guy and most consistent player throughout the nine-day invitational tournament as he repaid the support of the OFWs who always packed the venue. "It's always an honor to represent the Philippines," Brownlee told SPIN.ph after his second stint with Mighty in the tournament. "To the fans, you came out and showed support. To the Filipino community in Dubai, I just want to say thank you from the bottom of my heart." "It's always an honor showing the Pinoy pride, and always just fighting for you, guys, and trying to do our best for the country," he added. The resident Ginebra import even showed the never-say-die attitude for Mighty as he overcame a knee contusion and dizziness to lead the team to a win in its last game in the group stage of the tournament that drew the clubs from Lebanon, Syria, and UAE. Brownlee is hoping that his performance would help his naturalization papers that are now in Congress. "I hope so," the 30-year-old utility man said. "That would definitely help if it did. Just out here playing for the country means a lot to me, just being able to come and play with the Filipino guys; there's a lot of great local guys." For now, Brownlee takes a quick break as he extended his stay in Dubai for a few days with his family, before plunging back to action, probably for another Philippine representative, this time in the ABL in Alab Pilipinas. "We'll see when we get back to the Philippines. I'm not sure yet. Hopefully," Brownlee concluded.